Keith Axelrod, United Group’s Finance Managing Director recently earned a Series 24 General Securities Principal License, which qualifies him as a general securities principal for the Financial Industry Regulatory Authority (FINRA). This license allows Keith to supervise all areas of a member’s investment banking and securities business, including: underwriting, trading and market making, advertising, or overall compliance with financial responsibilities. He holds the license with MCM Securities, LLC. Keith was encouraged to pursue the license to offer United Group a second Principal at the corporate office of MCM Securities in Troy, NY. He currently works in a number of capacities as the Finance Managing Director, dealing with debt and equity requirements for existing properties and those in development. He raises funds through Private Placement offers, financial analysis, and works closely and networks with prospective sources and brokers. Candidates are given three hours and forty-five minutes to complete the Series 24 General Securities Principal exam, which consists of 150 questions. To successfully pass the exam, candidates must understand the critical functions of a general securities principal, including the rules and statutory provisions applicable to the supervisory management of a general securities broker deal. Passing the Series 24 General Securities Principal exam isn’t Keith’s only career achievement; he’s also licensed to sell Private Placement Investments to investors interested in real estate projects, and is a Registered Representative with MCM Securities, LLC and holds both the Series 82 and Series 63 FINRA Licenses. 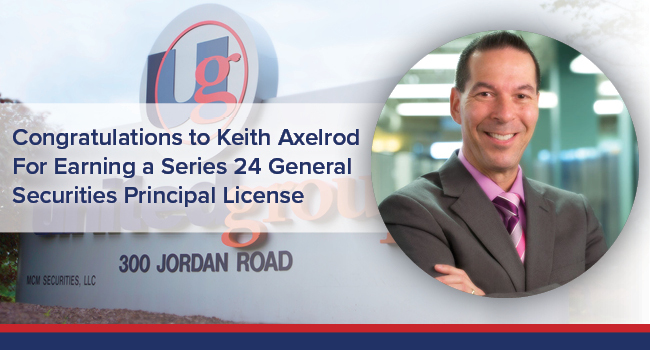 The United Group is proud of Keith for passing the rigorous Series 24 General Securities Principal exam. The hard work and endless hours of studying paid off, and he’ll certainly continue to play a major role in shaping United Group’s successful future.